This interactive lesson provides students with an understanding of how modern communication technology has impacted the president's relationship with the public and other government officials. From FDR's fireside chats to Trump's tweets, students will learn how presidents have used the technology available to communicate with the nation. This lesson is fun, engaging, and will get your students critically thinking. It is designed to be taught with students in small groups, while also able to see the board. 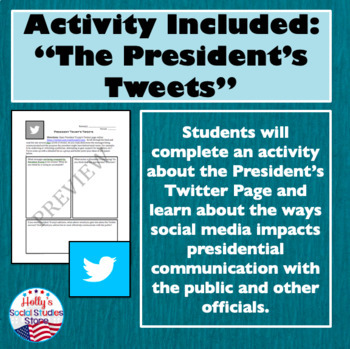 Students will discuss a warm-up prompt, brainstorm and discuss several different questions with their peers, take part in a classroom poll, learn important concepts related to presidential communication, and complete a group activity to examine President Trump's tweets to the nation. The presentation included also includes several video clips throughout that will further engage your students. 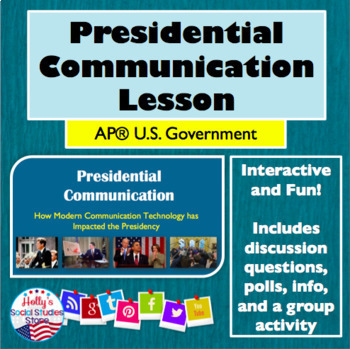 This resource was designed with AP® U.S. Government classes in mind, as presidential communication is highlighted in the newly redesigned course, but it's a great lesson for any U.S. Government course! 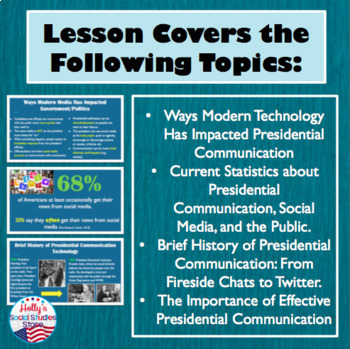 - 22-slide Presidential Communication Power Point (editable)-This presentation will guide students through the lesson with instructions, discussion questions, poll questions, video clips, and important information on the subject of presidential communication. 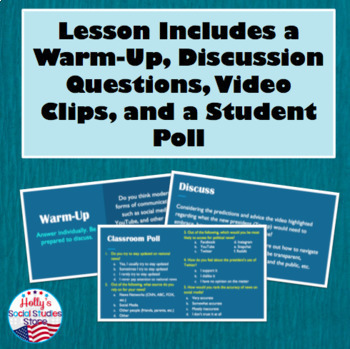 - Student Notes Sheet- Students will use this handout to document their warm-up, discussion questions, and notes throughout the lesson. - Trump's Tweets Activity- Students will examine numerous recent tweets on President Trump's active Twitter account. They will learn about all the various ways presidents can use social media to interact with the public and send messages about their agenda. Key Concepts Covered: Brief history of presidential communication methods, ways modern technology has impacted presidential communication, current national views about the president's use of social media, ways presidents can effectively communicate with the public, etc. Earn credits for your valuable feedback! After you purchase a product, return to your “My Purchases” page and provide feedback on this product. You’ll earn credits, which will give you discounts on your future TPT purchases. Your positive feedback is always appreciated! Visit my store and click on the green star to follow me and receive product updates: Holly's Social Studies Store. You can also follow me on Pinterest by clicking here.